The bathtub is the centerpiece of any powder room. Still, it's no wonder that we give so little attention to it when thinking about how to create the perfect bathroom style. In fact, we look at just about everything else first. We'll change the vanity and the mirror, we'll find wallpaper for the walls and open shelving for storage and decoration. We'll even think about what color combinations for the linens will go best with the tile, all before considering what to do with the tub. Of course the main reason that the tub is usually last on our decorating list is that they are the least convenient things to change in our bathrooms. Whether your bathtub style is old-fashioned clawfoot or something more standard and modern, pulling it out and replacing it is bound to be a time-consuming and expensive affair. But if, on the other hand, you are going further than a bathroom refresh and looking to completely remodel the space, then the bathtub is absolutely the first thing to think about when making your design plans, because the style of your tub can greatly impact the style and feel of your finished room. Better still, there are any number of great design approaches that you can choose from to create the powder room that you've been dreaming of. Here's just a few of our favorite styles. In a space typically dominated by tile, porcelain and stainless steel, wood is far from the material you would expect to see in a designer bathtub. Of course that's also most of what makes it such a great idea. This luxurious tub combines the craftsmanship of fine art with the shape and size of of a tub tailor-made for long soaks and Sundays afternoons of pure escape. In addition to its smooth texture and soft, organic curves this tub has the added benefit of bringing a larger pop of warm, wood tones to a space that is usually defined by a cooler color palette, while the wood brings an organic feel to the more clinical-feeling materials generally found in bathroom fixtures. Tubs of this type are excellent for creating a bathroom with a tropical, resort-style feel. Pair them with other organic elements like plants or floral wallpaper to complete the look. Designing your bathroom around a wooden tub doesn't automatically mean that you're after a rustic or old-fashioned look. Wood may be one of the most traditional of all building materials but with the right design, it can be a unique centerpiece to a very modern space. This tub from NK Woodworking & Design is a perfect example. While still bringing an organic or outdoorsy element to the space, the clean lines and hard angles of the design give it a very modern, engineered look. This model also has a strong architectural aspect which adds to its modern aesthetic while providing multiple surfaces for additional decoration or storage, all to help make sure that the next time you slip into a hot bath, you'll have everything you need so that you won't have to come out again until you're good and ready. In addition to changing up the traditional materials for tubs, designers are currently giving us far more options when it comes to the shape as well. Oblong clawfoot tubs and rectangular standard tubs are no longer our only options. There is also an array of round tubs, which bring their own unique aesthetic to bathroom decor. This round, stone tub is ideal for a meditative space, designed to take you away from the cares of everyday life. The dark, natural color of the stone, surrounded by lighter neutrals makes for a serene color palette that suits the design of the tub perfectly. Far from the confining lines of traditional tubs, the round shape feels expansive and open, creating and additional sense of luxury that will have you wanting to stay all day. This room is a wonderful example of the other elements that can be added to a round tub to create a meditative and relaxing space. Objects with curves or asymmetrical shapes or that are made from natural materials all help to bring an organic feel to a space that makes them feel calm and relaxing. To achieve this look in your bathroom, pair a round tub with other organic elements like stone, plants or wood. Rock beds like the one shown here can do double duty as both a design feature and a functional part of the space -- catching water from the tub while adding to its Zen appeal. If shaped wood and natural serenity are all a little too old-world for you, why not try something a little more forward-looking, The Balenia, a futuristic whirlpool spa bath from French manufacturer, Thassalor, combines a series of interior jets with a dramatic, cascading waterfall spout. It's sleek design, which is sure to set the tone in any bathroom space, is accurately reflected in the amount of technology this bathtub boasts. Featuring hydrojets and massage jets in addition to chromotherapy system that uses colors to promote relaxation and stress relief, this tub presents a fantastic spectrum of options for ensuring the best bath experience possible. And because the future is all about options, the Balenia comes with the opportunity to choose between no less that 512 distinct colorways, making it next to impossible for this tub not to fit into the color scheme of your powder room. The Vessel is the quintessential combination of futuristic design and old-fashioned comfort. Inspired by the all-encompassing relaxation of the hammock, British furniture company Splinter Works, created this minimalist design as the ultimate space for taking a moment to yourself. Constructed entirely from carbon fiber, the apparently soft shape stays completely fixed and rigid even when completely filled and occupied. Comprised of a single, luxurious curve, the base of the tub does not touch the ground but instead fills from a standing tap next to the tub and empties by releasing water out of the bottom into a drain located directly underneath. The future can be exciting, but it's easy for all of that technology and hyper-engineered design to leave you feeling a bit breathless. If, like many of us, you're someone who feels that there's just no substitute for old-world charm you might be looking for a bathroom that's more like something out of the past. Few pieces bring up such nostalgic feelings for days gone by and a slower pace of life as a wine barrel. So what better place to sit back and soak your cares away than a wine barrel tub? For any bathroom that's designed with a rustic aesthetic in mind, there can be no better choice than a tub like this. Pairing this piece with a few other elements, like the stone tiling on the wall behind this tub or the brick-colored tiles beneath will give you an amazing space to take a step back from the pace of day-to-day living. Rustic pieces don't always have to come in wood. Another interesting approach to take with your bathtub might be to look for something metallic. Copper freestanding tubs like the Euclid combine an old-fashioned bathtub style with a metallic finish that can look traditional or very modern depending on the design of the surrounding room. 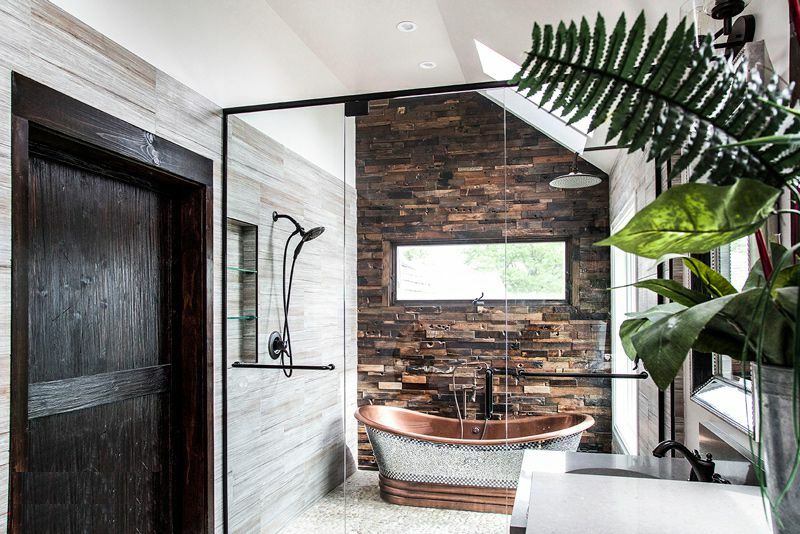 In this modern bathroom, the shape of the tub provides a pleasing contrast while the warm metallic sheen of the copper combines with the other wood and metal elements throughout the room to create a warm and inviting space. Some things are just built for comfort. Ergonomic design has become a big part of planning our living rooms, bedrooms and offices in recent years, so why not our bathrooms? Ergonomically designed bathtubs like the one seen here are specifically shaped to give support to the most crucial (and often the most tense) parts of the body to both relax away stress and prevent improper posture from causing new injuries. Even when not in use, the gently undulating curves of a tub designed to the contours of the body brings a pleasantly natural and feminine touch to the space that can be echoed in smaller accessories such as lamps, vases or even the patterns of wallpaper, shower curtains or rugs. It's a great way to create layers of pattern and shape in your bathroom for a sophisticated look with layers of style. Your tub doesn't need to be completely made of metal to add a nice metallic touch to your space. In fact, you might find that when it comes to metal accents on your tub, a little can go a long way. This whimsical little soaking tub, called the Primm, features wrought iron accents in the shape of cattails. Keeping the iron in its natural finish allows the sculpted plants to vary in both color and texture, adding to the organic feel of the freestanding piece. Finally, if you really want to give your bathroom a fantastic new look, there's always the modern approach. This sleek, luxurious design is tailor-made for bathrooms with a contemporary look. The built-in tray caddy means that you'll have everything you need from extra towels to your favorite drink. Or, you can use the tray as a base for more decorative options like aromatherapy candles, plants or an contemplative arrangement of stones.